My wife’s dad’s ancestral home is Coorg. Thus she is one part Coorg. If you ever meet anyone from Coorg, notice how proud they are of that fact. There is always a rarefied air about them, explaining why their noses are pointed up when they say they are from Coorg. Coorg doesn’t even exist anymore. It is Kodagu district, just another district in the big state of Karnataka in South India. Right after independence, Coorg Province was declared a state, and in 1956 with the State Reorganization Act, it was merged with Mysore state and in 1973, the state was finally renamed to Karnataka. The allure of Coorg though is not just in its history; the geography lends itself to myth. Kodagu district is hilly and any elevation is welcome when temperatures can hit 30 C easily in the plains. The highest peaks are all over 5000 feet and when temperatures are cooler and you are standing on higher ground, it is easier to look down from the lofty heights of being from Coorg. Madikeri, the Kodagu district capital is about 5 hours from Bangalore (very elastic, depending on where in Bangalore) and about 2.5 hours from Mysore. The roads are good, with national highway 275 leading you into the district. As you enter the higher ground, the lushness of the hills will pull you in. 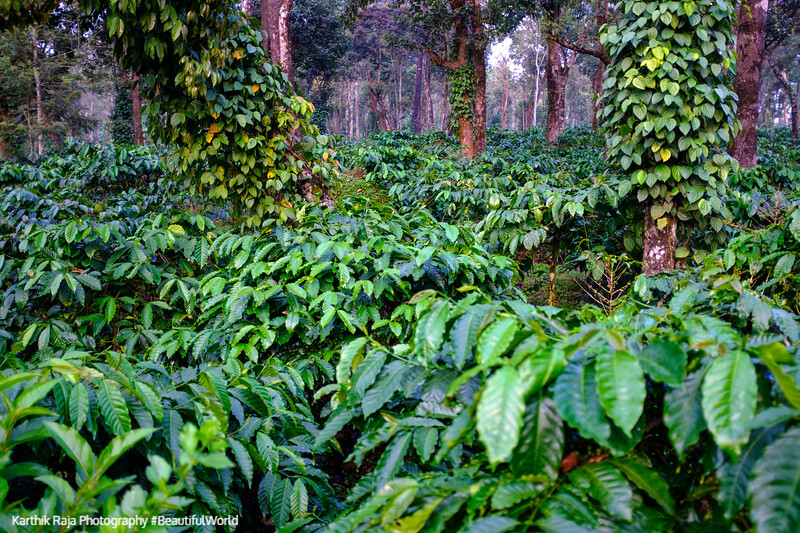 Coorg is famous for the coffee estates, with Chikkamagaluru being the second district in Karnataka. Together they grow and export some of the world’s best coffee robusta. Coffee is, also, finicky. It requires lots of shade to grow, with very specific elevation, slope and soil requirements. To help provide all of this, eucalyptus trees, with pepper vines and cardamom and vanilla are grown along with the coffee. Together these cash rich forests of coffee and spices made the Coorg people very rich and therein lies another part of the snob sum. While driving around, be sure to stop for Kodagu oranges, especially sweet and plum sized. Coorg is best experienced in slow motion. There are plenty of home stays, bed and breakfasts, resorts and spas that will ensure time slows down and with the extremely spotty cell coverage, you have all the time to kill. We stayed at Kavery Estate, a few kilometers south of Madikeri, along the river bank. Spend the mornings in the mist, walking through dense forests teeming with birds or strolling through estates of coffee and spices and let your senses refresh. Ask your host or hotel to make you a traditional breakfast with Akki Roti and Garlic chutney to go with it and for your other meals, plenty of vegetarian and non-vegetarian dishes are unique to the area. If staying put, with a book in one hand and coffee in another is not your thing, Kodagu district is also sacred. The river Cauvery (Kaveri) surfaces here, with Tala Kaveri as the widely acknowledged place of first sighting. A temple on the hillside capitalizes on this belief and thousands throng here to bathe in the first drops of this mighty river. The river surfaces above ground a few kilometers downstream at Bhagamandala, where three tributaries come together, gathering all the ground water from the hills and flowing as Kaveri. To the east of Madikeri is the Bylakuppe, home to the Namdroling Nyingmapa Monastery (or Thegchog Namdrol Shedrub Dargye Ling), the largest teaching center of the Nyingma lineage of Tibetan Buddhism in the world. The monastery is home to a sangha community of over five thousand lamas (both monks and nuns), a junior high school named Yeshe Wodsal Sherab Raldri Ling, a religious college (or shedra for both monks and nuns) and hospital. Together these sites make Coorg a hot spot for tourism. For kids, the Dubare Elephant sanctuary is worth the trip though with mixed reviews of the treatment of elephants there. It is government owned and a way for the elephants that were once used for logging to keep up with a routine. On your way out of Coorg, find a store with the big advertising boards and buy some chocolate to compliment the coffee beans and spices. A bottle of fresh forest honey will make the trip sweet to remember. Next Samsung S9+ – The Camera. Reimagined. 10 Use Cases to test the theory. Interesting read! What are some other traditional foods?